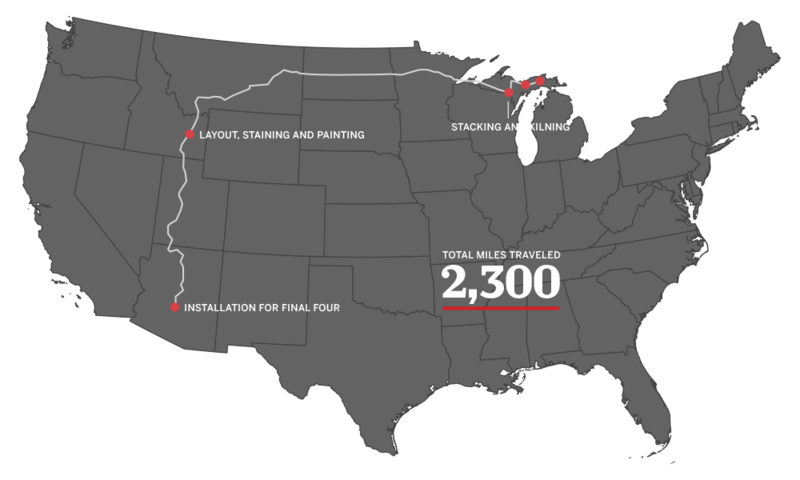 From deep in a Michigan forest to University of Phoenix Stadium in Arizona, the floor at this weekend's Men's Final Four has completed a cross-country journey, lasting nearly five months. 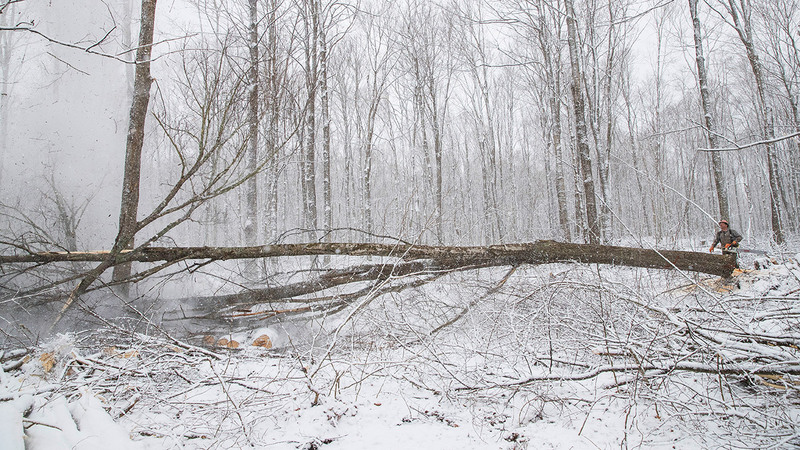 In a 24,000-acre forest, foresters select 500 sugar maples. Using a tanklike machine with rollers and chainsaws, the trees are sustainably harvested and chopped into as many 8-foot pieces as possible. 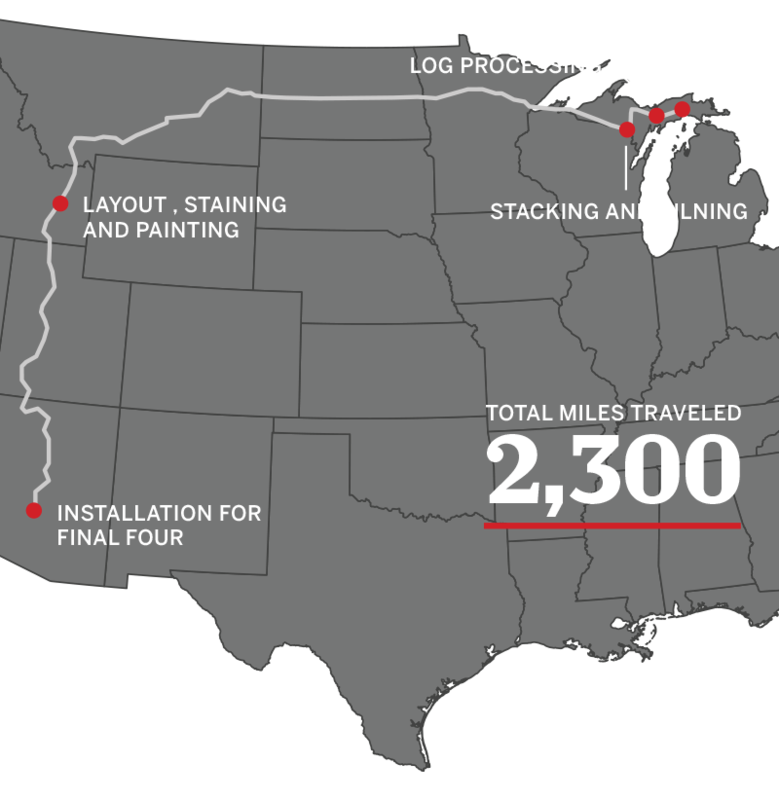 In a 24,000-acre forest, foresters select 500 sugar maples. With a tank-like machine with rollers and chainsaws, the trees are sustainably harvested and chopped into as many 8-foot pieces as possible. How much wood is used to make the floor? 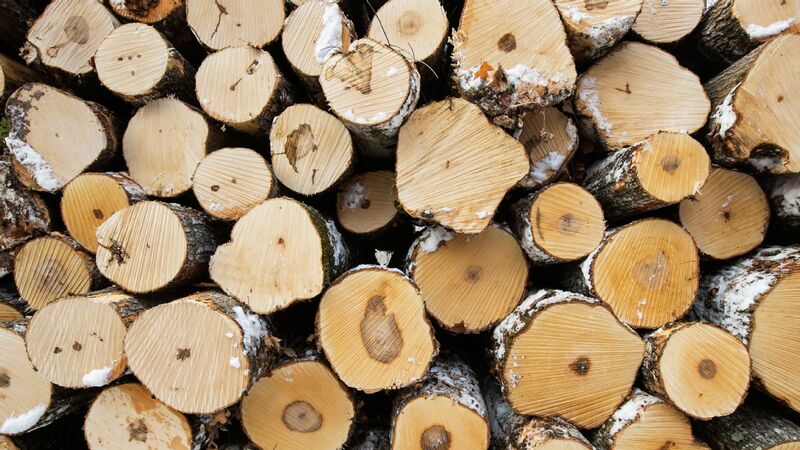 In a Michigan mill, trees are debarked, cut to planks and dried. To create the strongest floor, boards are staggered, like building an oversized floor at a home. 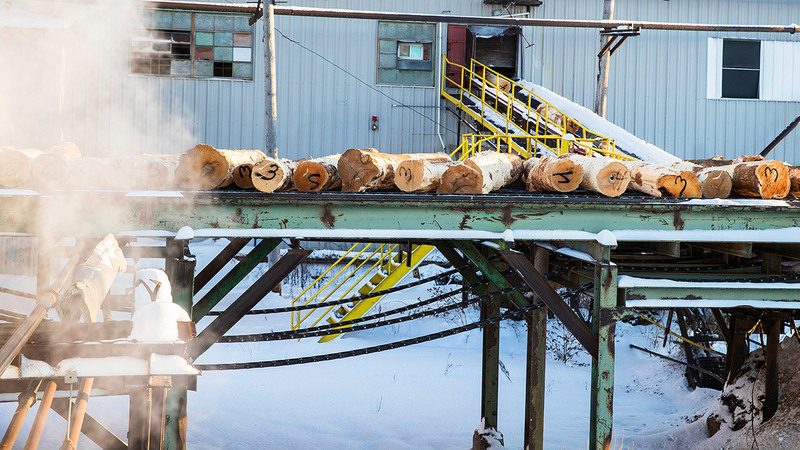 In a Michigan mill, trees are debarked, cut to planks and dried. To create the strongest floor, boards are staggered, like building an oversized hardwood floor at a home. Planks are shipped to Idaho, sanded and measured. The floor becomes a giant paint-by-numbers picture. Every inch is stained, and, using NCAA graphics as stencils, the floor is painted. Planks are shipped to Idaho, sanded and measured. The floor becomes a giant paint-by-numbers picture. 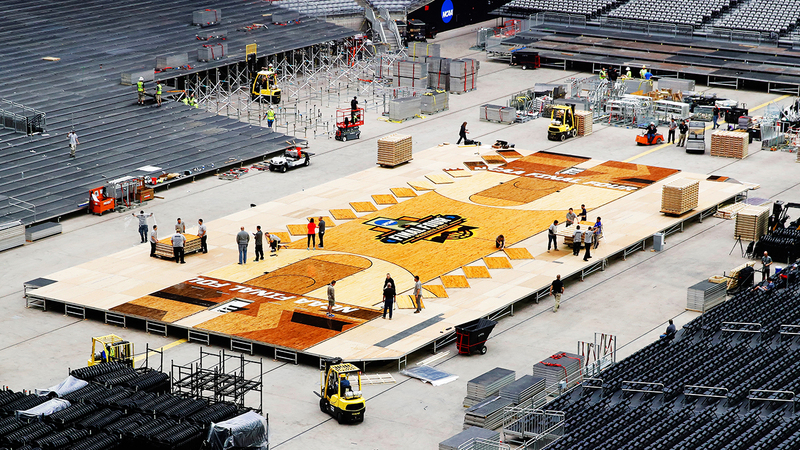 Every inch is stained and, using NCAA graphics as stencils, the floor is painted. 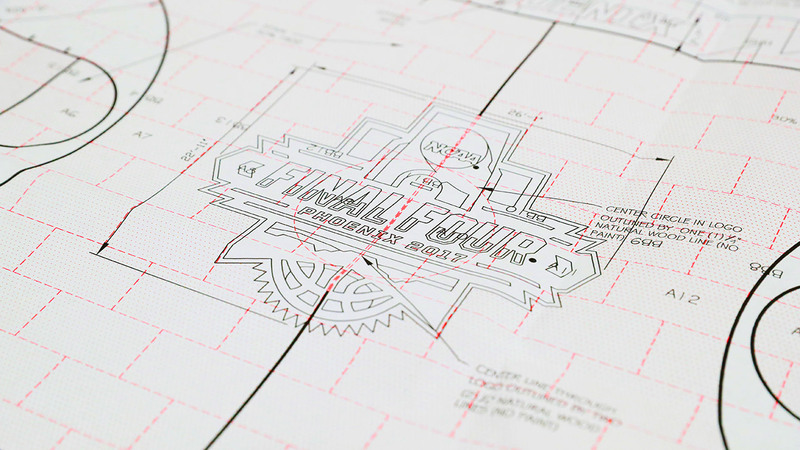 What Brings the floor design to life? Arriving on two 18-wheelers, the floor is assembled in Glendale using a pin-and-hole system. The floor is then altered to accommodate the sidelines and baselines. Then it's time for basketball. 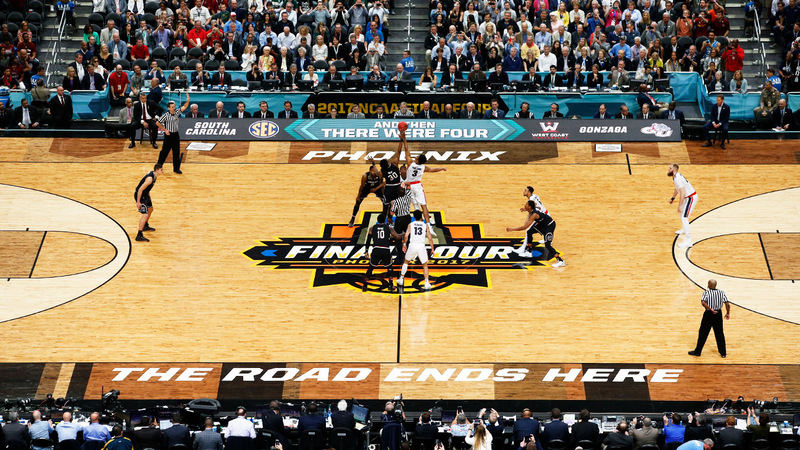 For the first game on the Final Four court, South Carolina tips off against Gonzaga.